July 24, 2018—–I was sitting in the shade outside a museum in Tucson last winter when a conversation started between my family and another family nearby. The topic? Olla (pronounced “oy-yahs”) pots…a watering system used by the Chinese 2000 years ago! Why hadn’t I heard of this method? 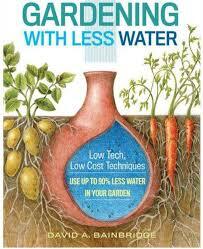 Growing up in the upper Midwest, where the soil is rich and rain plentiful, nothing ever needed watering! 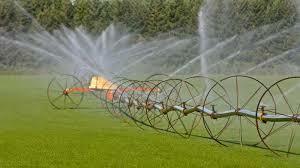 Crops thrived in the moist, rich, black soil of our farm and most farmers had never seen an irrigation system. On my first trip to Colorado, in my early 20’s, we traveled Highway 76 past crops being irrigated by a rolling irrigation system on wheels, which ran over the top of the crops, dispersing water from the above pipes. The Wheel Line system is mobilized through the field by a gasoline engine, spraying water on crops throughout the field. It seemed like an expensive way of farming, both environmentally and economically, depleting the nearby water sources, while battling with ongoing surface water rights. As complex as the Wheel Line system is, at the other end of the spectrum is the simplest method…Olla pots. 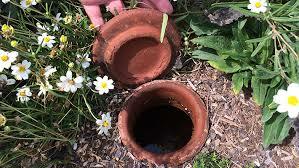 The ancient Olla method consists of unglazed, porous clay terracotta pots buried in the ground. The drier the soil the more water is pulled from the pots by roots sucking water through its pores, or by soil moisture tension which is the result of nearby drier soil drawing water out of the pots, allowing for moisture equilibrium between the soil outside and inside the pot. 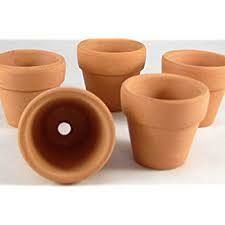 Put white putty on the inside and outside of an unglazed terracotta pot (the clay pots you usually plant flowers in) to seal the hole in the bottom. Bury the pot all the way up to the rim next to your plants and fill it with water. 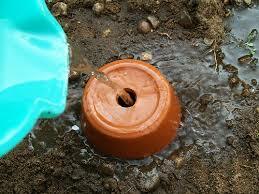 Put the plant base (which usually comes with the pot) over the top of the pot to prevent evaporation. The roots of the plants nearby will find their way to the pot and attach to it, seeping out the moisture and also, as stated before, equilibrium will allow the drier soil to pull water out through the pot’s pores. The Olla watering system is a great water saver, plus a dependable method of watering the garden if you’re leaving on vacation for a few days! Categories: Building Green, Climate Change, Renewable Resources, Sustainable Education | Tags: #climatechange, #ollapots, #renewableenergy, olla clay pots, Renewable Resources | Permalink.